Tonight I was frustrated with myself, as usual, when I still couldn’t get a technique right on the 4th or 5th try. My partner, as he’s done several times before, just smiled and told me to be patient. 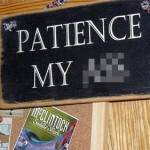 I was reminded of the above sign, which hangs on my office door. I originally bought it (at the local tack store, of course) because it so perfectly described how I felt most of the time. Obstacles be damned, let’s get things done! That’s a good thing, right? And with most intellectual challenges I get right up to speed. I can become fluent in information, ideas, facts, concepts, and vocabulary really quickly. Throw me in a deep end, and I’ll swim. I do it all the time in my work. I think my proficiency with that kind of learning makes it all the more annoying that physical learning doesn’t work the same way. Our bodies only “get” things just so fast. Rushing is counterproductive. If you play guitar, maybe you remember learning a barred F chord. You were never going to get it. It sounded awful, and felt awkward. You must not be doing it right. It was impossible, probably for months. And then one day it was just there, and it was easy. There were some tips to learn, of course, but hurrying, using more muscle, and getting mad at yourself didn’t help a bit. You just had to practice. There are days when one Aikido technique or other is that barred F chord. I can see how it’s supposed to go. Everyone else is doing it gracefully and effectively, but I can’t do it to save my life. Hurrying, using more muscle, and getting mad at myself never help. I still try them all, of course, but I’m getting a little better at recognizing that mental state, letting those things go sooner, and getting back to patiently, slowly, calmly trying again, and trying again, and trying again. “The functioning system should be able to move along the way that it moves along, without being inflicted on negatively, or improperly, by an I-self system." I think I’ve noticed an interesting rhythm to what is covered in classes: As exams approach, about every 2 months, classes focus more on techniques that are required for the exams (thank goodness!). Just after exams, we get to try some more interesting things. Both of the classes I did today covered new (to me) ground. Fun stuff! You know how being cooped up inside all day makes you want to run and play once you get outdoors? I think writing deadly dull things like software specs does the same for my writing. I have to run around and play. I’ve been reading some of our dojo newsletters online, and although they are written in prose, I hear what’s said as poetry. So because I tend to rewrite anything that crosses my path, I’ve been running around and playing with rewriting newsletters as poems. I can’t say if this a “good” poetry, but I hope it touches you. Inspired by the teachings & writings of Dave Goldberg Sensei, Aikido of San Diego. And experience her silent power. Let The Earth support you. Perceive the vastness of the sky. The stars are always above us. Let yourself breathe in The Heavens. Fill where there is emptiness. Relax where there is tension. Let Your Body speak. And listen. Attack with your whole heart. Bring your gifts of energy and direction. Go fully where Nage takes you. Let yourself welcome their gifts. Take Uke where they are going. Notice where your heart is grounded. See where balance has been lost. Let Your Self return to a solid base. Notice where our hearts are grounded. Be the space for Everyone to connect. Copyright 2009, Linda Eskin. You may use or share this freely, provided you include the entire content of this post, including this copyright notice. I did my exam for 6th kyu this morning. At our dojo, Aikido of San Diego, we start as unranked. The first test is for 6th kyu. What I’ve been telling my non-Aikidoka friends is that this test is a little like graduating from kindergarten. I had to show that I basically know my colors and can tie my own shoes. Simple stuff, but hard for a beginner to master. I was mentally off-kilter from having just run back from the restroom (there had been a line). Everyone was already seated on the mat, and my exam was first. So it was run back, sit down, get up, go! I was winded from rushing, and it took a few minutes to recover from that at the start. I was not expecting to have to do shikko (knee walking), so I had no idea why Sensei was asking me if my knees were injured. I think that was my only real deer-in-the-headlights, “duh” moment. I had never tried it on the mat (only once at home), but got through it OK.
Sensei pointed out afterward that my kokyu-dosa (suwariwaza) could be bigger, with better extension. Overall I’m very happy. Naturally I wanted to nail every last detail, but I did OK, and didn’t embarrass my teachers. I’ll take it. I had a great time preparing for the exam, and was lucky to work with a very capable mentor – Scott Bjerke. I have never felt so much on the receiving end of the “it takes a village” (to raise a child) concept. In addition to learning from Dave Goldberg Sensei and the other instructors, I have learned from nearly everyone in my dojo, and from others as well. Maybe I can start helping others along now and then (on simple stuff, for the moment). Now that I have been through the testing process once, I’ll be paying attention in a slightly different way in class now (and likely taking notes after classes). And I’ll certainly be paying more attention to the names of each technique. Having achieved this little first step, one of my next goals (in addition to working toward 5th kyu, and getting in better physical shape, of course) is to begin to explore applying what I’m learning in Aikido to my riding and other work with my horse. I’ll be posting those adventures here, too. Many thanks for the ongoing encouragement. Early on I injured my shoulder, and I have recovered completely from that injury. I have lost 20 pounds. I worked with a personal trainer/PT to set up an exercise program, and am in better shape than I have been in years. I’ve made new friends at the dojo, locally, and online, and have reconnected with still more friends through Aikido. I’ve seen several rounds of tests, including the Sho-Dan test of one of my favorite sempai. I’ve learned that I like (and need, really) meditating before class. I’ve been to a dojo picnic, a party, and camping. I’ve always enjoyed learning, so I dove into Aikido from many angles. Even before looking into local dojo I listened to all 9 episodes of the “Aikido – The Way of Harmony” podcast (which you can fine in the iTunes Store). I have listened to them again since, many times since, and I’m sure will many more. Together they are a great introduction to Aikido, and I hear them in a completely new way each time I listen. I’ve read a nightstand-full of books, including “The Art of Peace” (O Sensei) of course, “Aikido and the New Warrior” (edited by Richard Strozzi-Heckler), “The Way of Aikido – Life Lessons from an American Sensei” (George Leonard), “Aikido for Life” (Gaku Homma), and “In the Dojo – A Guide to the Rituals and Etiquette of the Japanese Martial Arts” (Dave Lowry). 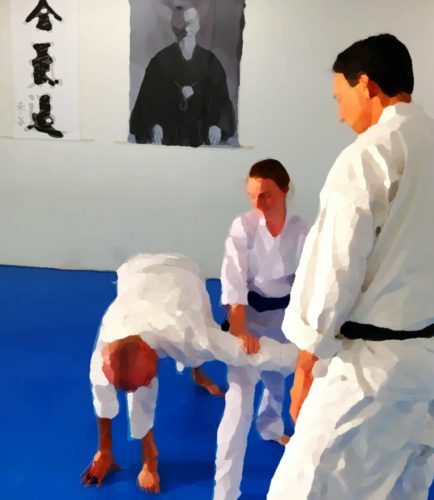 Shifflett’s “Aikido Exercises for Teaching and Training” has been a great help generally by providing a broad look at training and learning, and specifically by sharing good information on stretches and exercises that address some problems I have had for years. And of course it was the horse trainer Mark Rashid, and his book “Horsemanship Through Life,” that brought me to Aikido in the first place. Videos have provided still more information and inspiration, including Ellis Amdur Sensei’s DVD, “Ukemi from the Ground Up,” George Ledyard Sensei’s 3 DVD (videos) set, “2006 Seminar on Entries,” and many, many shorter, less formal videos on YouTube. I’ve also found “Aikido 3D” (software) to be a very useful tool for reviewing the mechanics of techniques. It’s perfect for those “how did that technique go, again?” questions that haunt one late at night. I had no interest in weapons at first, thinking of them as a kind of interesting sideline for people who are into that sort of thing. Now I have my own set, and enjoy training with them every bit as much (if not more, on some days) as I enjoy open-hand practice. So far I’ve participated in classes at the dojo with Dave Goldberg Sensei, of course, and also with most of the yudansha: Mike, Karen, Jason, Megan, Cyril, and Andy. Each has an entirely different style of teaching, and they all complement each other beautifully. I’ve also been fortunate to participate in several seminars with visiting instructors. Robert Nadeau Shihan came to our dojo in late July for a two-day seminar on “Aikido as an Art of Harmony,” giving us all an opportunity to look through the lens of Aikido at how we are in other areas of life. His coming here also gave me a “be healthy and back on the mat by” date when recovering from my shoulder injury. I’ve never been so proactive about healing, and by gosh it worked. It took a little convincing to get my brain to realize that rolling would be OK again (you can read my earlier post on that process), but I did it, pounding heart and all. Our own Dave Goldberg Sensei, who’s August Aikido In Focus workshop, “Relax, it’s Aikido,” had me giggling with the fun and joy of it all, and days later awash in tears as I realized how much I had been guarding myself against feeling, in my body and my heart, for a very long time. This past weekend was a three-day retreat in the local mountains with our Dave Goldberg Sensei and guest instructor Kayla Feder Sensei. Again, whole new ways of experiencing Aikido, of thinking about (or not thinking about) technique, and applying Aikido for the advancement of humanity. A side benefit of the Retreat was that it provided a reason to pick up my guitar again, which I did with far less frustration and more success than I expected. In preparing for this test I have been working several times a week with my mentor, Scott, a senior (in rank) student who is a wonderful teacher, endlessly patient, enormously capable, and always kind and compassionate. I’ve learned as much about teaching as about technique, and I hope I can put some of that to good use if I have the opportunity to mentor a kohai someday. I could not strive for rigor and mindfulness on the mat while letting other aspects of life go to pieces. I set some small goals at the beginning, and met them all. My car, which was always littered with fast food wrappers, empty water bottles, and hay, has been clean for months. I decided to stop fumbling in hurried frustration every day with a simple gate latch in my electric fence, and set my mind to opening and closing it fluidly on the first try. I typically run late for everything, but have not been late to a single class, or arrived unprepared. As I reach this first milestone on the path I’m considering what goals to set for the next leg of the journey. Some of them will involve horseback riding, which I set aside while initially immersing myself in Aikido. I will be seeking a balance between Aikido and dressage (essentially an equestrian martial art) in the coming months. Honestly, I found Aikido of San Diego in the usual pedestrian way on the web. The location and schedule were convenient. I liked everything I saw and read, and was impressed with attitude of the people I met when I observed a class. So I signed up. I expected a decent school with solid instruction. I hit gold. If this is how it goes getting to this point, I can hardly imagine what might lie ahead. I’m too tired to be eloquent this evening. I’ve been working with my mentor, a senior student at the dojo, preparing for my upcoming (9/19) 6th kyu test. It never ceases to amaze me how perceptive a good teacher can be. Working with him has done my Aikido a world of good. Only 2 more sessions with him before the test. I’m nervous/excited, but not panic-stricken. Feeling pretty good about it. This weekend (Fri-Sun) is our dojo’s annual fall Aikido Retreat. 3 days of training and other fun in the local mountains. This will be the first I’ve gone to (I only started in May of this year). The guest instructor will be Kayla Feder Sensei, and of course our own Dave Goldberg Sensei. There’s no matted area, so no rolling. Lots of weapons work, and non-falling Aikido. I have it on good authority that it’s going to be a blast, and I’m really looking forward to it.